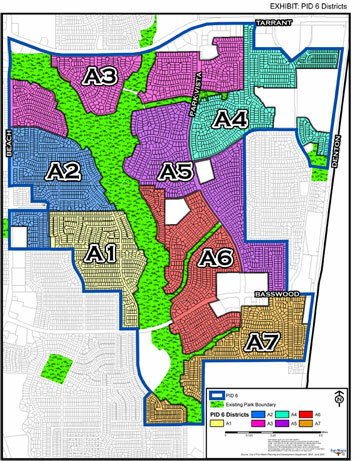 PID 6 comprises the neighborhoods of Park Bend, Park Glen, Park Place, Parkway at Park Glen, Parkway Hill, Parkwood Hill Estates, Summerbrook, Basswood Park, and the Villages of Parkwood Hill. The PID was divided into 7 districts to ensure equal representation based on the number of homes. Click on the image to view the PID 6 districts (labelled A1 to A7).